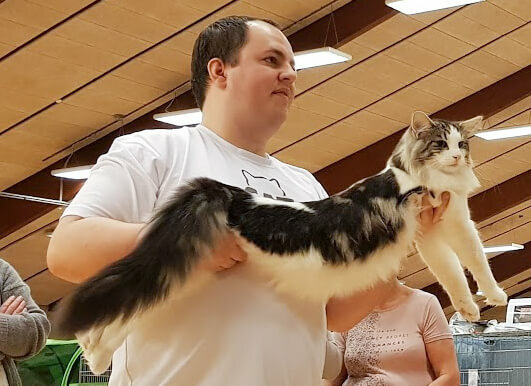 16-04-19 – In the weekend our wonderful boy GIC S*Pax’ Julius, JW DVM became Scandinavian Winner 2019 in Turku, Finland! 16-04-19 – There is now new pictures of The Constellation Litter! 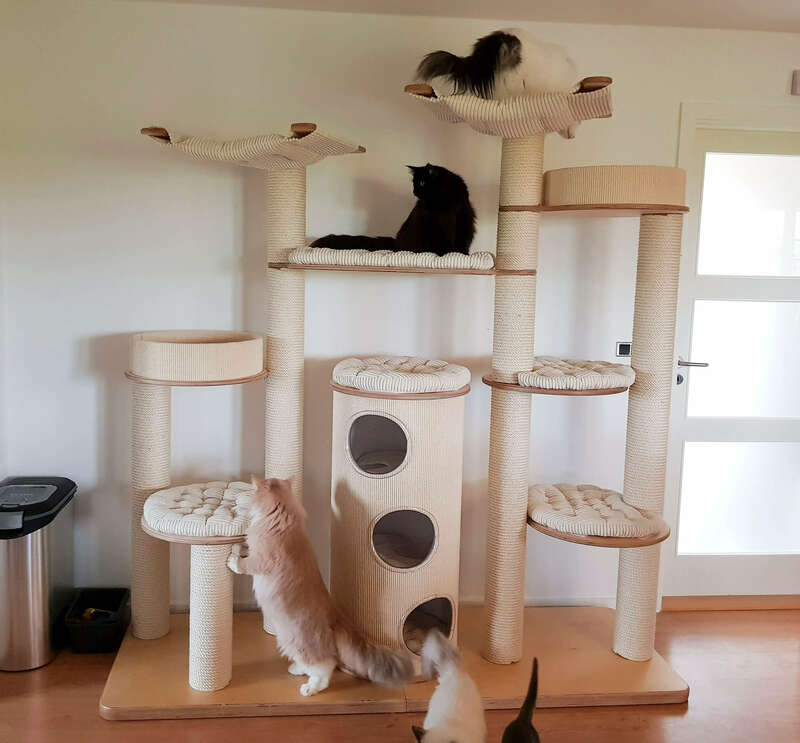 27-03-19 – Today the cats got a new tree and they love it. 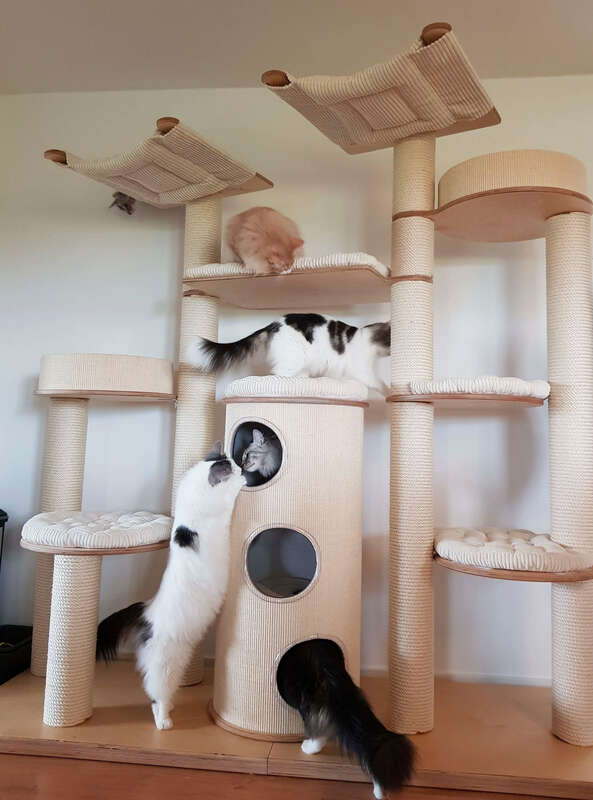 22-03-19 – We are currently looking for calm homes for a few adult Norwegian Forestcats. Please contact us to hear more. 09-03-19 – There is new pictures of The Constellation Litter. 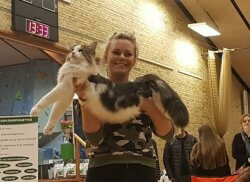 04-03-19 – GIC S*Pax’ Julius, JW, DVM became Best in Show saturday in Dragør, and also BIV. 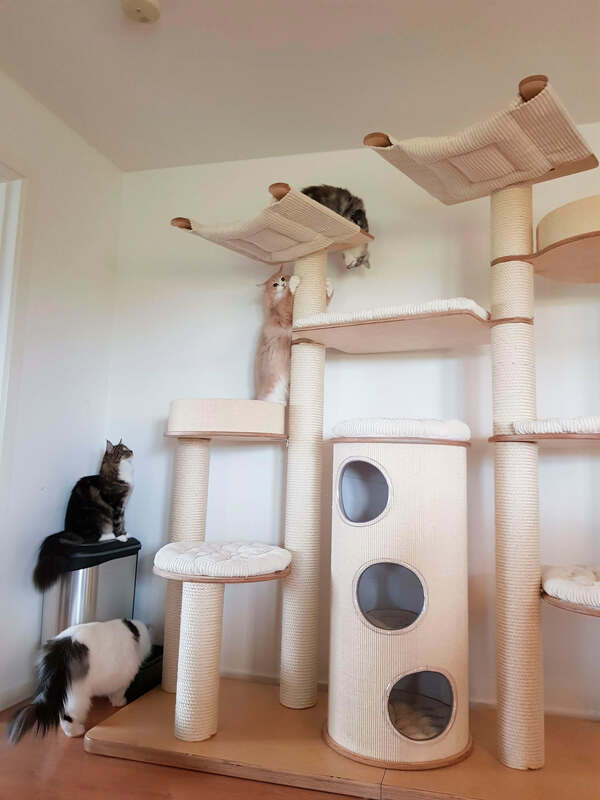 04-02-19 – We can now celebrate the birth of three wonderful kittens. Welcome to The Constellation Litter. 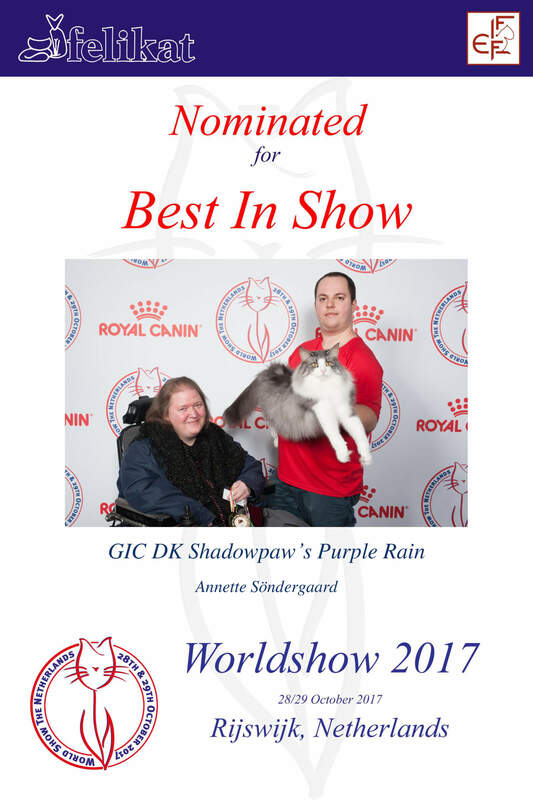 13-01-19 – At the show in the weekend, SC DK Shadowpaw’s Purple Rain, DVM became Best in Show sunday and BIV both days. 17-12-18 – Today Purple Rain, Julius and Galates have been at HCM scanning. They all have normal hearts. 03-12-18 – There is new pictures of our beautiful babies on their sites. Have a look here. 25-11-18 – We had a fantastic show in Århus with some great results. DK Shadowpaw’s Zaphira is now Champion. 11-11-18 – This weekend GIC S*Pax’ Julius, JW got himself a new title, along with awsome results in Poland. He is now Distinguished Variety Merit. 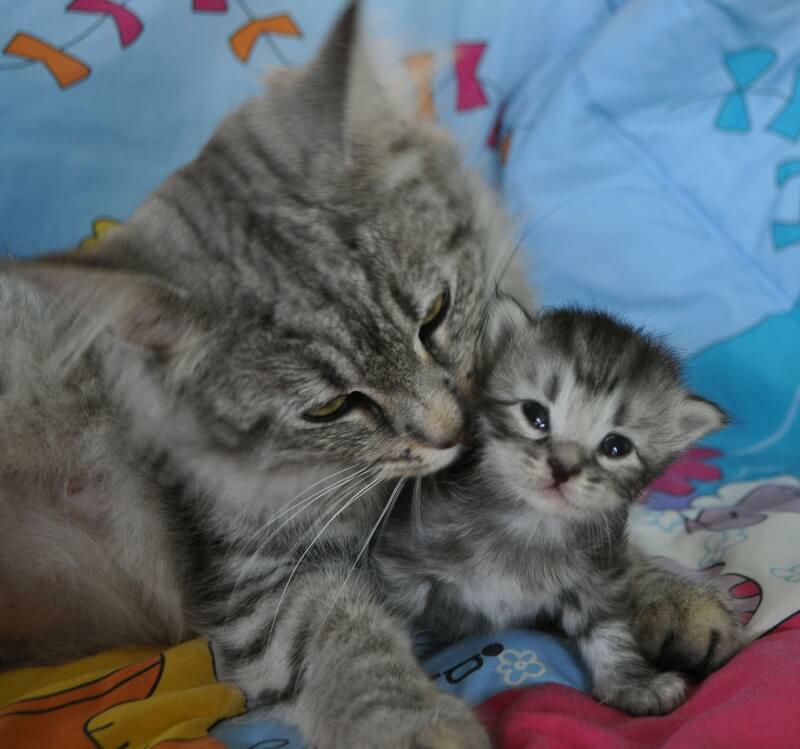 22-09-18 – This night DK Silverleaf’s She’s My Kind of Girl and D*Muffin’s Galates became parents to three beautiful babies. You can see them here on their Facebook-page. They will get their own page here soon. 20-07-18 – The kitten pages are now updated with new photos again. 13-06-18 – All the kittens pages are now updated with new pictures. They are growing a lot and they are so nice. Have a look here: Batman & Robin litter and Cards litter. 26-05-18 – Both litters is now one week old and they have all gotten their own sites now. Have a look: Batman & Robin litter and Cards litter. 19-05-18 – Both Fe and Zaphira had their babies today. We are happy to celebrate birthday of five beautiful and healthy babies. They can be seen here: Batman & Robin litter and Cards litter. 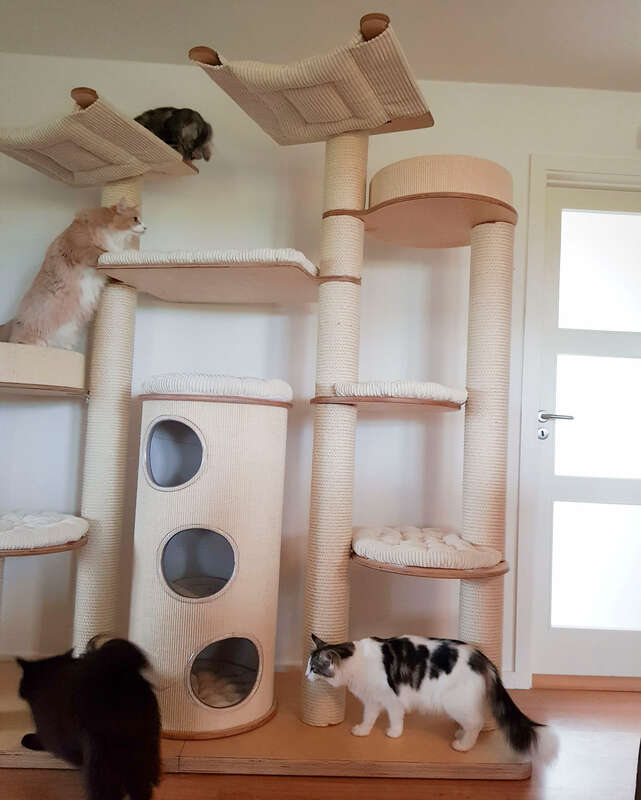 17-05-18 – Making summer show-plans while waiting for IC DK Dan-Queen Fe and DK Shadowpaw’s Zaphira to give birth. The proud father of both litters is our very own SC DK Shadowpaw’s Purple Rain, DVM. We look forward to welcome the babies into our family. 13-05-18 – We have had a wonderful weekend at Racekatten’s show in Hvidovre. So many nice things happened but the two highlights for us are not even our own results! Saturday DK Silverleaf’s Avalanche became BEST IN SHOW. Huge congratulations Christina, with your wonderful boy. Sunday Thomanis Chai (daughter of IC S*Pax’ Julius, JW and Thomanis Bøh) became BEST IN SHOW. Since it was her 5th BEST IN SHOW, she is now JUNIOR WINNER. Huge congratulations Annie and Thomas, DK Thomani. 11-02-18 – This sunday we attended Racekatten’s anniversary exhibition in Ejby hallen. We had D*Muffin’s Galates with us for the first time and he was such a brave little boy. He became EX1 and got so much praise. We also had SC DK Shadowpaw’s Purple Rain, DVM with us and he surprised us with both HP, Best in Variety and BEST IN SHOW! 28-01-18 – This weekend have been amazing! Yesterday DK Silverleaf’s Super Trouper became DK Silverleaf’s first JUNIOR WINNER! We are so extremely proud and happy for our boy and his owner, Pernilla. Big congratulations to you and S*Bökestorps! On top of that, we also ended up with several BIV’s and NOM’s with our own cats, and the highlights, apart from the Junior Winner title to Mr. Trouper, was that our beloved SC DK Shadowpaw’s Purple Rain, DVM became BEST IN SHOW male and D*Muffin’s Éowyn became BEST IN SHOW female and BEST OF BEST 4. 17-01-18 – The Weather litter have now all found their new wonderful homes. 18-12-17 – There is now new pictures of the Weather litter. See them on Facebook here. 03-12-17 – We had amazing results on the years last show in Albertslund. We celebrated SC DK Shadowpaw’s Purple Rain, DVM’s Supreme title and his DVM title. Thanks to everybody who came to celebrate with us. On top of the celebration, Purple Rain got another Best in Show today. This means, that this year he have gotten: 11 BIV, 14 NOM, 7 Best in Show, a Best of Best 4, two Best of Best 3 and one Best of Best 2. We are so proud of our wonderful boy. 31-10-17 – In the weekend DK Silverleaf was at the FIFe World Show 2017 in The Netherlands and we had amazing results! CH S*Pax’ Julius, JW got CACIB with tough competition. GIC DK Shadowpaw’s Purple Rain also got his certificate with even bigger competition. He also became Best in Variety AND NOMINATED FOR BEST IN SHOW! That means that he is now also Distinguished Variety Merit. 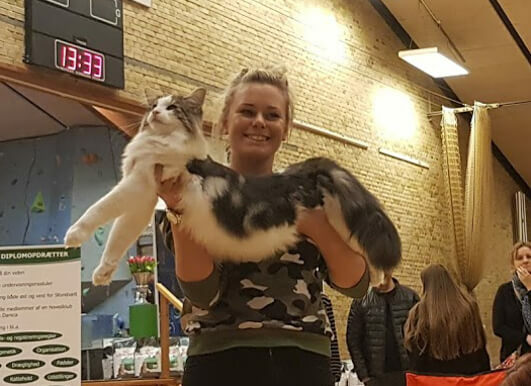 He was the only Norwegian Forestcat who got votes on the stage. He got 3 votes and the winner got 6 votes. He did not become World Winner officially but to me, he will always be a World Winner. 17-10-17 – DK Silverleaf’s Hot Sauce and CH S*Pax’ Julius, JW became parents to a big litter this night. Seven babies have been welcomed into the world and they are so beautiful. For more info about them, please visit their own page here: The Weather litter. 03-09-17 – Fantastic weekend in Hedensted. The ABBA litter became Best in Show both days. Furthermore Zaphira became EX1+NOM both days, She’s My Kind of Girl became EX1+BIV+NOM both days and Best in Show sunday. DK Silverleaf’s Waterloo became EX1 both days, DK Silverleaf’s Take a Chance on Me became EX1+NOM+Best in Show saturday and EX2 sunday. 02-09-17 – We are expecting kittens between CH S*Pax’ Julius, JW & DK Silverleaf’s Hot Sauce! 23-07-17 – In Brejning we had awsome results! Fe became Champion, Tequila became NOM, Julius became Best in Variety, NOM and Best in Show. At the same time the Abba litter have started to move to their new wonderful homes. 04-07-17 – The cocktail litter have now moved to their new families. We wish then a long and happy life in their new wonderful families. 14-06-17 – Éowyn and Julius‘ litter are two months old today. Have a look in their own page. 12-05-17 – Desdemona and Snipers litter are two months old today. They are getting big and beautiful. 27-04-17 – Tick’a and Kiksen became parents to a beautiful blue boy. He got his own page here. 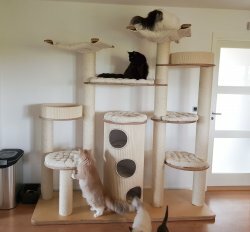 14-04-17 – Julius and Éowyn’s kittens arrived. We welcome a beautiful Abba litter. 02-04-17 – In Århus the second day Purple Rain became Best in Show and Julius became EX1, Best in Variety and Best in Show! 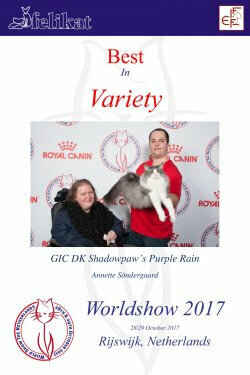 01-04-17 – In Århus Purple Rain became Grand International Champion, Best in Variety and Best in Show and Julius became EX1, Best in Variety and Best in Show! 12-03-17 – Desdemona and Snipers litter have been born. We welcome four beautiful babies, please have a look at their page. 26-02-17 – Purple Rain became Best in Show and Julius became Best in Variety, Best in Show, Best in Category and BEST OF BEST (all breed/ages) in Warsaw. 25-02-17 – S*Pax’ Julius is now JUNIOR WINNER! 25-02-17 – Julius became Best in Variety, Best in Show, Best in Category and BEST OF BEST (all breed/ages) in Warsaw. 13-02-17 – Purple Rain and Éowyn is scanned HCM normal which we are very happy about since health means a lot to us. 05-02-17 – Julius had an amazing day in Nærum. He became Best in Show with very tough competition. 29-01-17 – Purple Rain did it again with a Best in Show more and this time also a Best of Best 3! 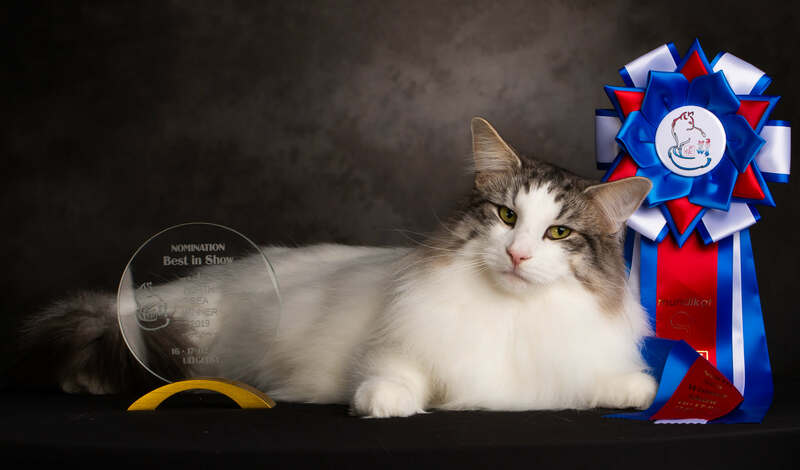 28-01-17 – Purple Rain won his first Best in Show and it was even a Best of Best 4, Best silver cat on the show and Julius also became Best in Show! !